Phosphorus is a necessary nutrient for aquatic life. The natural balance in Georgian Bay can get harmfully thrown out of whack on the high and low side with human interference. We add risk to our near-shore water by contributing too much phosphorus in wastewater and fertilizer run off among other sources, that is further exacerbated by intense rainfall from climate change. Too much phosphorus under the right conditions can lead to the formation of algal blooms, some of which can be toxic. Conversely, there is a threat of too little phosphorus in the deep open waters threatening the food web. For example, there has been a collapse of diporeia, a miniscule freshwater shrimp that was once the most abundant benthic organism in the offshore deep parts of Lake Huron and Georgian Bay that coincided with the timing of active filter feeding by invasive mussels. The lack of phosphorus in the outer waters is possibly linked to these invasive mussels (zebra and quagga), which we brought to the Great Lakes in the ballasts of ships and through other human pathways. A report called the "State of the Bay 2018" looks at total phosphorus in eastern and northern Georgian Bay as an important water quality measurement, and it is the first issue to be addressed among key issues confronting the Bay. The report was compiled by the Georgian Bay Biosphere Reserve (GBBR) with support from a steering team that included Georgian Bay Forever. It indicates that the trend for total phosphorus is deteriorating, meaning it is showing change away from acceptable conditions. "Water Quality: Total Phosphorus" full article from the State of the Bay. Are the offshore deep waters of Georgian Bay in trouble? By David Bywater. David Bywater is the State of the Bay Project Manager for the Georgian Bay Biosphere Reserve, a not-for-profit dedicated to environmental and community well-being. He can be reached at conservation@gbbr.ca. To find the full State of the Bay Report, please visit www.stateofthebay.ca. Think about what makes life possible underwater. Phosphorus is the “food” that microscopic plants and animals need to survive. As the foundation of our food web in Georgian Bay, phosphorus is an important nutrient for us to measure when we study the health of our ecosystem. You can imagine that there wouldn’t be many fish or loons without healthy nutrient levels supporting the rest of the food web! To find the full State of the Bay Report, please visit www.stateofthebay.ca. Georgian Bay Forever has a history of supporting novel research and finding contemporary solutions to help improve water quality monitoring by working with academic institutions, like-minded-partners, and municipalities. Building on our previous water quality work and collaborations in standardizing protocols, GBF is focused to improving the efficiency of water quality monitoring and evaluating the impacts of net pen aquaculture to ensure sustainable policy. Revolutionizing water quality measurement with Canada's first autonomous underwater vehicle. 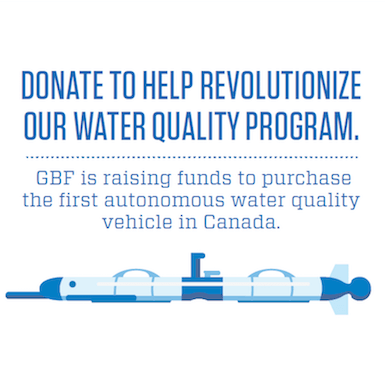 Georgian Bay Forever is excited at the prospect of purchasing the first Canadian Autonomous Underwater Vehicle (AUV) which would drastically improve water quality data measurement. We need your help to get it! Through this machine, we are hoping to create high resolution data maps of the watersheds and a number of chemical and physical parameters. 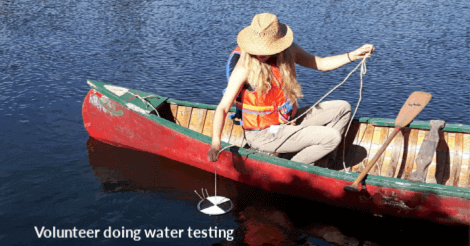 This would include measuring the amount of chlorophyll, turbidity and biomass of plants. Increases in these factors can be indicators of excess loads of phosphorus. Additionally, this device will allow the creation of Digital Elevation Models (DEM) for Canadian waters; a digital representation of the watershed…allowing predictions to be made to model the impacts of climate change, water levels, development, spills, sewage outflows, septic failures, bacterial contamination or conservation measures. Learn more here. Assessing the impact of net pen aquaculture in Georgian Bay. Past research that was compiled for GBF has shown that among other risks, nutrient loading from phosphorus either in the form of food or waste from this type of fish farming could deteriorate water quality (and has done so in sites like Lake Wolsey as revealed by the Georgian Bay Association in their Spring 2018 newsletter). Industry has taken steps to alleviate some of these concerns, but no evaluations have occurred since the changes and rules are shortly to be set for expansion of this industry. GBF is engaged in providing scientific information about what kind of sites and practices do not harm water quality and aquatic ecosystems. To learn more about the research in Georgian Bay by the University of Guelph that Georgian Bay Forever is funding, please visit this link. Standardizing Protocols. Georgian Bay Forever (GBF) worked from 2011 to about 2016 to standardize water quality measurements with partners in Eastern Georgian Bay including the Georgian Bay Biosphere Reserve and Severn Sound Environmental Association. 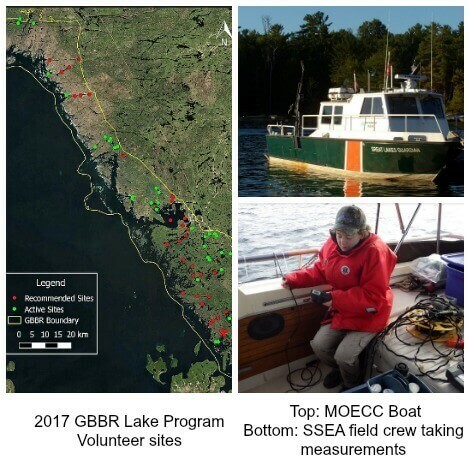 For the Township of Georgian Bay, GBF prepared a report that analyzed water quality monitoring in the area and recommended plans for going forward. Within the report is a discussion an Assessment of cyanobacteria dominance in embayments along the Georgian Bay Coastline. Summarized findings showed that “favourable conditions for cyanobacterial growth already exist in these oligotrophic [low nutrient] embayments and mean [average] epilimnetic [above the thermocline and metalimnetic [transition zone in the themocline] total phosphorus concentrations need only rise, say 50% to mesotrophic [moderate nutrient] levels of 12 - 15 μg/L (similar to Sturgeon Bay) from current levels of 8-9 μg/L to generate blooms of nuisance proportions." Given rising Great Lakes water temperatures and increased precipitation (run-off) from climate change, and the presence of iron and anoxia (favourable conditions for bloom formation), the process and responsibilities for monitoring were solidified. Supporting research by the University of Toronto's Associate Professor Maria Dittrich in Honey Harbour to help her research measuring the make-up of the sediment, and its capacity to release phosphorous into the water. Supporting research that challenges the focus of looking at phosphorus in isolation as a cause in cyanobacteria bloom formation, and reveals the critical role of anoxia and ferrous iron. See the report by Molot and others, York University. Phosphorous has been monitored in Severn Sound since 1969. 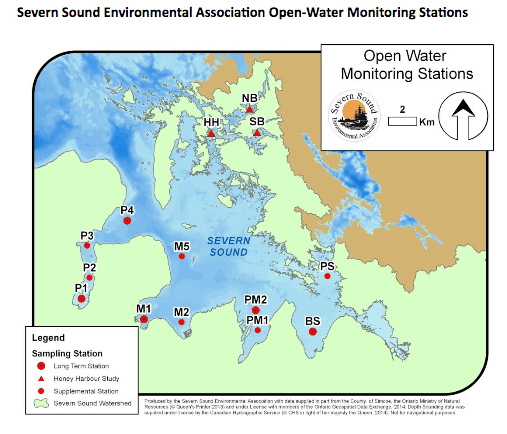 The sound was formerly listed as a Great Lakes Area of Concern, as the 1970s and 1980s marked a period of high nutrient loading from sources including wastewater-treatment plants, private septic systems and agricultural and stormwater runoff. Severn Sound was considered eutrophic (nutrient-rich) at that time and experienced excessive algae growth, particularly in Penetanguishene Harbour. A combination of remedial actions, such as controlling runoff from farms, as well as stewardship activities, septic upgrades and water-treatment upgrades, combined with ecological changes (such as the introduction of zebra/quagga mussels) have led to significant reductions in total phosphorus and algae growth. The Remedial Action Plan (RAP) targets for total phosphorus of 20 µg/L for Penetanguishene Harbour and 15 µg/L for the rest of Severn Sound continue to be met. 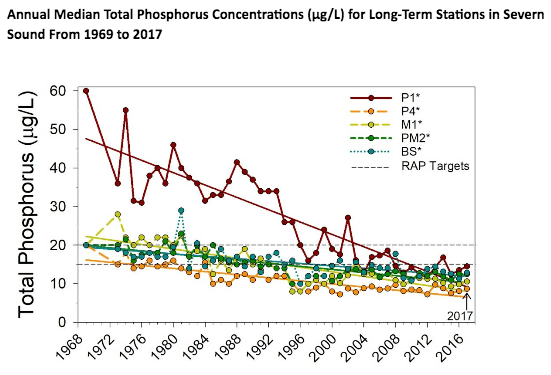 There have been no significant trends in total phosphorus since the mid-1990s, except for a decrease in the inner Penetanguishene Harbour. Although Severn Sound is now considered lower in nutrients, it is important to continue with remedial actions and monitoring, as climate change and invasive species continue to affect water quality in often-unpredictable ways. The LAMP is the Lake Huron Lakewide Action and Management Plan, 2017-2021. Its purpose is " In keeping with the Great Lakes Water Quality Agreement (the Agreement), the governments of Canada and the United States have committed to restore and maintain the chemical, physical, and biological integrity of the waters of the Great Lakes. This 2017-2021 Lake Huron Lakewide Action and Management Plan (LAMP) fulfills a United States and Canadian commitment of the Agreement to assess ecosystem condition, identify environmental threats, set priorities for research and monitoring, and identify further actions to be taken by governments and the public that address the key threats to the waters of Lake Huron and the St. Marys River"--Executive summary, p. viii. Keep cattle out of streams; leave a buffer strip to trap nutrient and sediment runoff; and plant a shelter belt.